"Pingus was trading at over $200 before the first bottle was ever released. 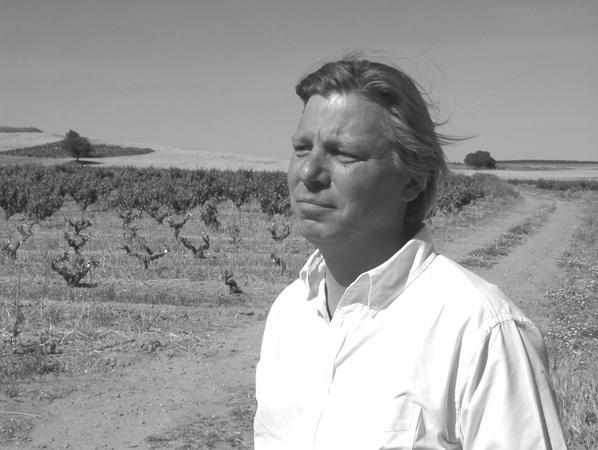 Peter Sisseck's monumental 1995 Ribera del Duero, from some of the region's oldest vines, was just that exciting. While other wines from Rioja and Ribera del Duero had acheived international recognition, Pingus was the first wine to transcend traditional Spanish winemaking. Peter had created a great, mammoth, supple testament of a wine--in short, a new archetype. With only a few vintages released, Pingus has already joined that elite club of producers--Raveneau, Chave, Giacosa-- whose wines combine a true sense of their origins with fiercely singular personalities. Peter's tiny production of fewer than 500 cases comes from three parcels of ancient, head-pruned Tempranillo vines. His true genius may be demonstrated in the vineyard.The gnarled old vines have been carefully husbanded back to health-- the trunks straightened, lowered, and pruned back to 1-2 buds per stump. Yields range from a high of 20 to an incredibly low 9 hectoliters per hectare. After fermentation in steel or large wooden vat, the wines are raised in a mix of new and old French oak. Peter uses as little sulphur as possible. Like a top chef, Peter carefully seasons the young wines, controlling their exposure to oxygen and utilizing lees contact to give the final wines their exotic textures. Yet this simple discussion of techniques cannot begin to explain the final product, a wine Robert Parker has called "extraordinary" and "one of the most outstanding wines produced in Spain." James Suckling 94"Fresh and classy nose of cherries, currants and raspberries with hints of pepper. Full body, beautiful and fine-grained tannins and a long, flavorful finish. Delivers the Pingus magic!"